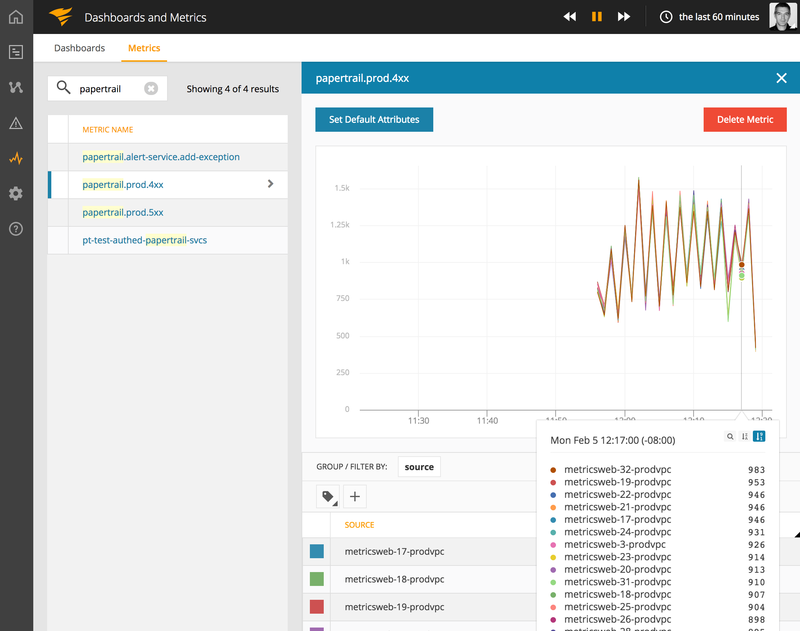 Papertrail provides hosted log aggregation and management, including real-time tail, search, and Heroku-optimized alerts on application and platform logs. Papertrail is a member of the SolarWinds family. With this integration you can send the result of saved searches (e.g. count of errors) on a pre-defined interval to AppOptics so that you can graph the trend. On the Search page you can add a new Alert. 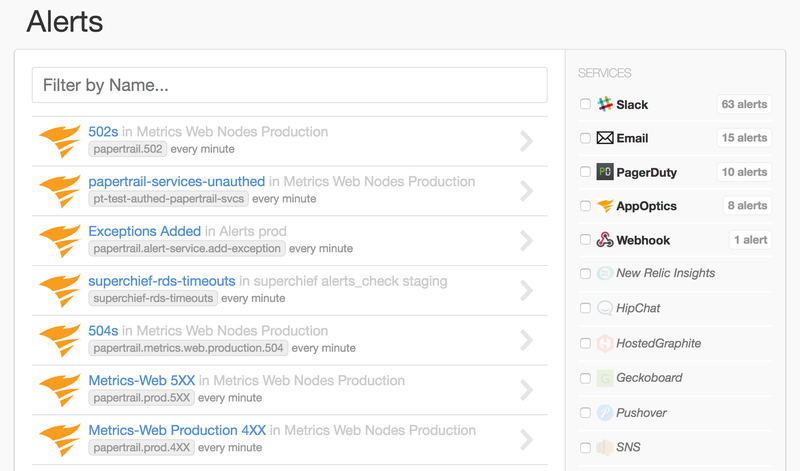 The “Choose a Service” page lists all the services that Papertrail supports. Choose “AppOptics” under “Graphing & Metrics”. The AppOptics Alert Configuration page requires you to enter an AppOptics API token which you can find or create on your Org settings page. We recommend you create a record-only (write-only) token for Papertrail metrics. Paste the token into the appropriate field and select a metric name. Select the frequency. If you choose “1 minute” the number of events that happened in each minute are summed and sent to AppOptics. The metric name must be URI-safe, i.e. only contain alphanumeric characters, periods, hyphens, underscores, or colons. All the saved searches show up under the Alerts menu. After configuring Papertrail head over to AppOptics and search the metric list for the newly created metrics. 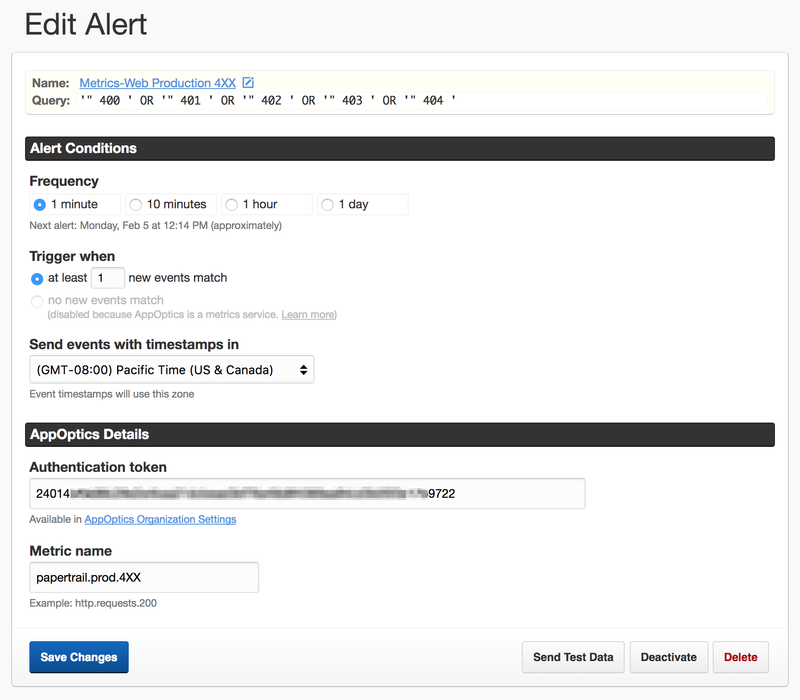 Keep in mind that they will only show up if a search result detected events and they were posted to our API. Impressed? Try it out now!